John Vernon Good, Sr., 95, of Traverse City, passed away peacefully Saturday, August 11, 2018 at Traverse Manor Assisted Living while surrounded by his loving family and caring staff. John was born Jan. 24, 1923 to the late Rex and Bessie (Woodcox) Good in Indiana. At the young age of 19 he married his best friend, Wanda (Farver) on Aug. 7, 1942 before leaving to serve in the U.S. Army during World War II. They spent over 75 years of being deeply devoted to each other. Later, John enjoyed his career as a Retail Store Manager for Sears & Roebuck Co. for over 30 years in Indiana and Michigan. If you ask any neighbors, they would tell you that John had the best looking yard in the neighborhood. Happy to always help those in need, his kindness will always be remembered. Friends and family will miss his jovial sense of humor and contagious laugh. He would tell people he’s been “Good” his whole life and when asked how he was feeling he would smile and say with his fingers. In John’s younger years his most enjoyed hobby was wood working. 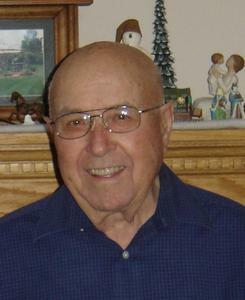 His children and grandchildren were fortunate to receive many handmade gifts from him over the years including wooden trains that still adorn the family Christmas tree during the holidays. He could also play music by ear playing guitar while in WWII and played the organ for the Methodist Church congregation that his family attended. John was an avid reader even at the age of 95 and especially enjoyed reading spiritual books. He also enjoyed working side by side with his wife, including volunteering at Munson Medical Center ER for over 10+ years. He was a devoted husband, father, grandfather and always provided for his family. His patience grew immensely over the years and he was such a Godly man. Grandchildren enjoyed tractor rides, playing games, and cooking with Grandpa. We all enjoyed his stories about WWII and the old days. Our family feels blessed to have had so many wonderful years with such a loving husband, father, grandfather and great-grandfather. John missed Wanda incredibly and expressed his readiness to be reunited with his bride and our Heavenly Father. He will also be reunited with his late parents; siblings; daughter, Jeanee; and two grandsons, Eric and Michael. He is survived by four of his children, Linda (Mike) Keeton, of Hershey, Pennsylvania, John (Beth) Good Jr., of Rock, Sandy Good, of Traverse City, and Mark (Catherine) Good, of Belding; several grandchildren and great-grandchildren. John’s family wishes to express heartfelt gratitude to the Hospice of Michigan and Traverse Manor staff for their sincere compassion and soothing care that brought comfort and peace during his last days. Burial for John and Wanda will be held at Ft. Custer National Cemetery in Augusta, MI on Thursday, August 30, 2018 at 1 p.m. To honor his wishes, full military honors will be held for John. Memorial contributions may be made to Hospice of Michigan (Traverse City). Please visit www.lifestorytc.com to sign the guestbook and share your thought and memories with the family.